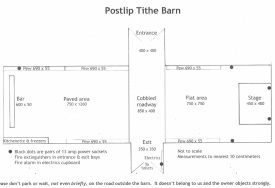 Postlip's medieval Tithe Barn is an authentic ancient building, but it is also a working barn that we use for repair, maintenance, construction projects, and storage. It's a wonderful space for people to enjoy wedding receptions and we hire it out four times a year. We now have a licence for civil ceremonies so you can get legally married in the barn as well as holding your reception here. 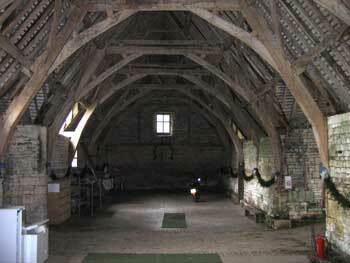 Community members volunteer to run events and income from hiring the barn goes into maintaining Postlip Hall and barn, which are listed buildings. The barn is unheated so our season starts in May and ends in September. 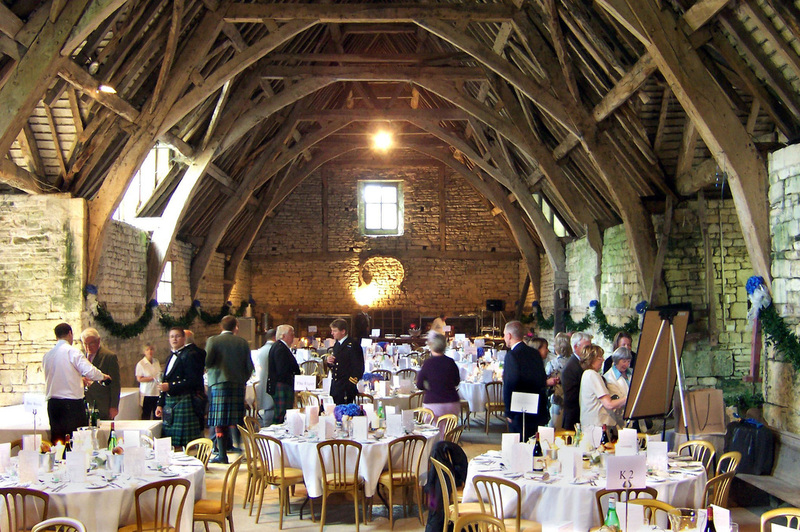 Since many of us are away in August we don’t offer weddings during that month and the barn is booked for the Cotswold Beer Festival during the second half of July. We give you access to the barn the day before your party and the day after for clear up. 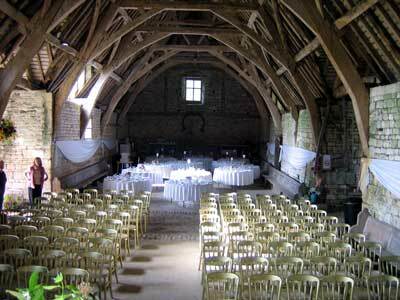 For 2014 the barn hire cost is £2,400, or £2,940 if you include a civil ceremony. (You'll need to pay the Registrar's statutory fees). People book early. We are fully booked for 2014 and already have two bookings for 2015. Contact us if you are interested in available dates in 2015 and 2016. The barn has ample power sockets, a kitchenette and bar with hot and cold running water and an adjacent loo block with disabled access. The main space is about 30m x 9m, and there's a 5m square stage at one end. See the floor plan below. The barn will take about 150 people seated at tables. There is a parking field next to the barn for about 50 cars, but most organisers arrange for a minibus to avoid guests having to choose between drinking and driving. Our top terrace, woodland glade and pavilion are all available for wedding photos. For wedding enquiries Email Heather.